This edition features the exact same content as the traditional text in a convenient, three-hole-punched, loose-leaf version. Books a la Carte also offer a great value for your students?this format costs 35% less than a new textbook. ? 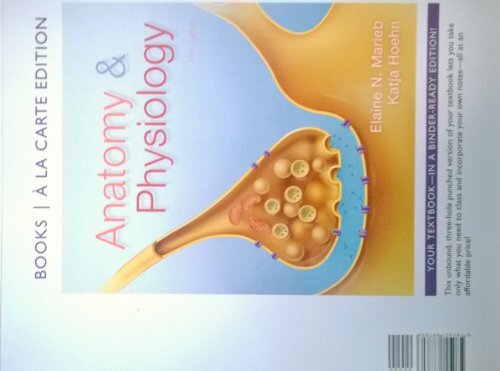 Anatomy & Physiology, Fifth Edition answers the demand for a leaner version ofElaine Marieb and Katja Hoehn?s top-selling Human Anatomy & Physiology while maintaining itstrusted, accurate approach. This streamlined text excludes coverageof pregnancy & human development, heredity, and thedevelopmental aspects of body systems, while maintaining coverageof key A&P concepts. ? Marieb draws on her career as an A&Pprofessor and her experience completing her nursing education;Hoehn utilizes her medical education and award-winning classroominstruction?together, they explain anatomy & physiologyconcepts and processes in a meaningful and memorable way. ? The new Fifth Edition makes it easier for you to learn key conceptsin A&P by presenting information in smaller and more digestiblebites, making it easier to distinguish key concepts from supportingdetails. New ?At the Clinic? case studies help you to learn byapplying your knowledge of A&P to clinical situations. ? Package consists of: Books a la Carte for Anatomy & Physiology, Fifth Edition ?